Halloween has passed, so now we are in full fledged Holiday season!!! You have to put away the ghost, goblins and spiders but the pumpkins can stay out for another month. In an attempt to find new options for my mantle I came across these great DIY pumpkin ideas. 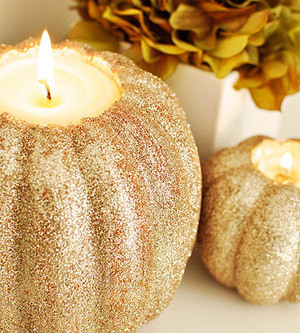 This glitter pumpkin will add sparkle and bling to any tablescape, bookcase, or vignette. In order to make this gorgeous glitter pumpkin I found on Twig & Thistle you will need a Styrofoam pumpkin, drill and hole saw attachment, spray adhesive/craft glue, glitter and a candle. Slice off the stem of your pumpkin and use your hole saw attachment to drill out the section where the stem was, be sure the hole is slightly larger than your candle so it will fit. Using a spoon, continue to carve out the foam until your candle can be slipped in and not seen. Then you can either coat the pumpkin in craft glue or use a spray adhesive (the spray is much easier and faster but be sure to be outside or in a vented area) and cover with your choice of colored glitter. Once dry, spray the whole thing with hairspray (yeah!!! one more reason for Aqua Net!) This will set the glitter and reduce the amount ending up on your floor. Grab one of those books you read on summer vacay and make it into a pumpkin book. 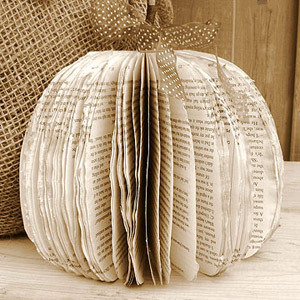 I love the neutral, old world feel of the tea stained pages that make up this rustic pumpkin I found on Craftberry Bush. Your supply list includes: an old paperback, a stick to act as the pumpkin stem, cardboard, scissors, hot glue gun, tea bag and ribbon(optional). First remove the front and back cover of the book-leaving the spine intact. Cut the cardboard into a half circle (or any shape you desire) and place on the book, trace and cut. Make a cup of hot tea then squeeze the tea bag over the pages to stain them. Once the pages are dry, glue the stick to the spine of the book. Then take the first and last few pages of the book and glue them together, making sure to adhere the pages to the stick as well. Add ribbon! I love the holidays and creating my own decor using uncommon materials and colors. I’m working on more resourceful, affordable ideas. . .stay tuned to Spark and be inspired! !